I've been seriously slack in posting my trip reports here on Trailspace because I stopped in May of 2016 and feel the need to catch up. 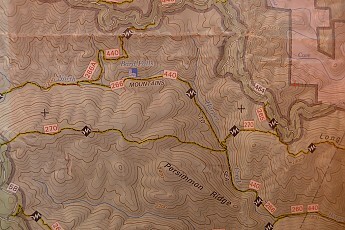 The next trip therefore in the Trip Archive needs to be a 24 days backpack into my old Pisgah stomping grounds---in the Wilson Creek backcountry of Upper Creek and Raider Camp and Harper/North Harper and Lost Cove Creek. All trips start with a drive and a gear layout and so I leave East TN and arrive in Black Mt NC at Amy's house where I'll leave my car for 24 days and she will shuttle me to the Upper Creek trailhead. Around me are my Accoutrements of Idiocy---the crap I will need for the duration. 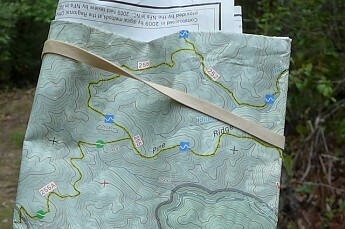 We arrive at the Upper Creek trailhead in Pisgah NF and start up Trail 268A---a 2 mile trek along Upper Creek. 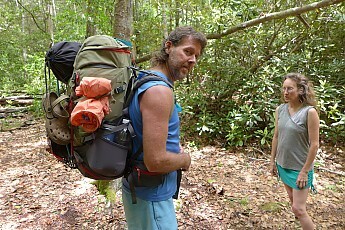 Amy decides to join me for a night but she's no stranger to backpacking as she thruhiked the AT in 2006 and the BMT in 2015. 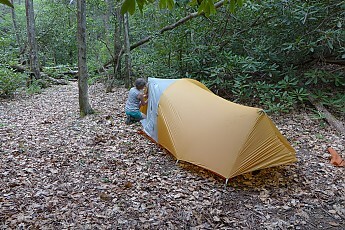 We reach our campsite where Burnthouse Creek junctions Upper Creek and Amy sets up her Big Agnes tent. After Amy leaves I'm back to a solo trip and leave the Upper Creek watershed and enter "The Fish"---a series of trails and a backdoor to Raider Camp and Harper Creek. A pretty waterfall along Phillips Branch. 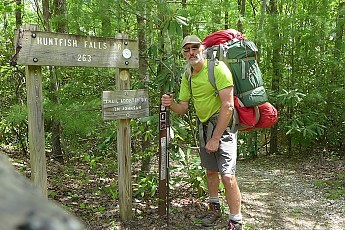 After pulling The Fish I enter the heart of Pisgah's wilderness on Harper and North Harper and Lost Cove Creek. 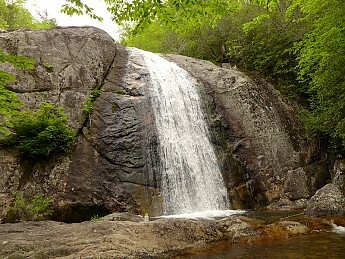 I stay on the Mountains to Sea trail (white dot) and reach the trailhead down to Huntfish Falls on Lost Cove Creek. 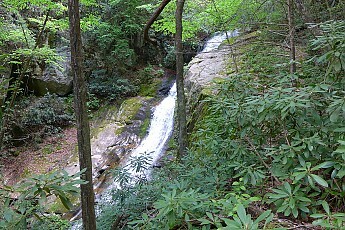 A view of Huntfish Falls as the Lost Cove Creek trail passes nearby. I eventually return to North Harper Creek trail and camp by North Harper Falls---check out my water bottle for scale. It's time for a May 2016 dip in the holy Pisgah waters. 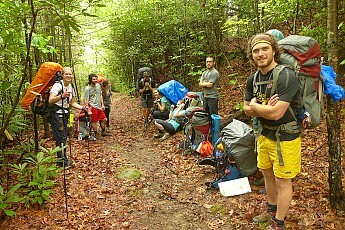 I leave the Lost Cove/Harper area and return to Upper Creek on the MST and run into these kids from Appalachian State. 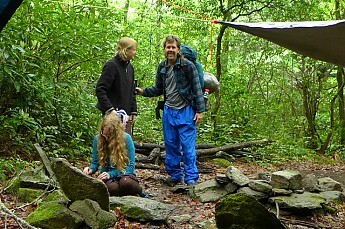 I return to my Upper Creek camp from Day 1 and prepare to meet all my friends for our 32nd year reunion---as we all first started backpacking into Pisgah in 1984. 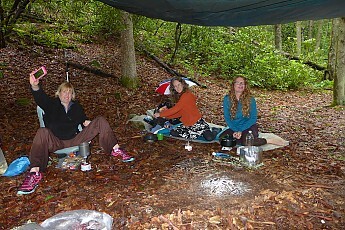 Amy is the first to arrive in the rain and set up her camp. The girls are the first to arrive and they are Karen, Amy and Renee. 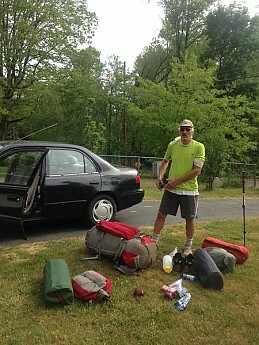 We're all waiting for mighty Johnny B---my old backpacking buddy thru the 1980s and 1990s. Johnny Arrives!! We're Pisgah Brothers and have humped the ruck hundreds of times in these NC mountains. 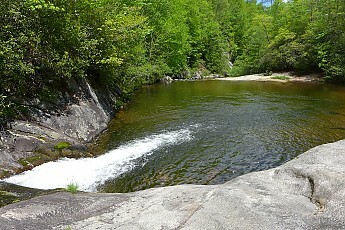 No visit to Upper Creek in Pisgah is complete without a visit to Upper Creek's Gorge---a mighty rock canyon. 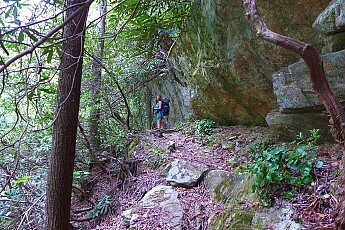 This pic shows Karen on Trail 268A into camp. 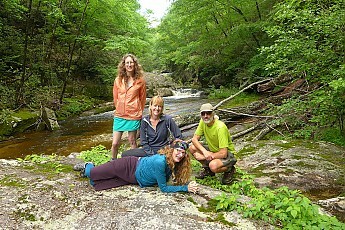 Next to our Burnthouse Campsite is this Upper Creek swimhole as Amy and Johnny catch up---the Pisgah Crew is back together! 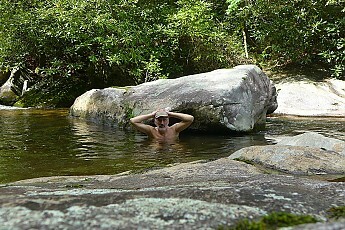 We built several sweat lodges here over the years and fired up the hot rocks and then jumped into this big pool. Near the end of my trip like on Day 23 Johnny puts on Amy's pack to check it out. 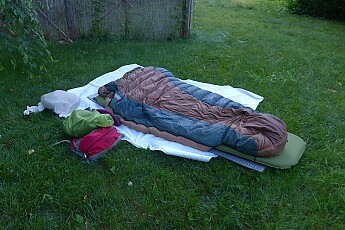 I leave Piz with Amy and spend my last night cowboy camping in her backyard---and then drive home. Great Pisgah reunion trip. Any plans for another Piz reunion? Not this month as I'm gearing up for a long swaray into the Bald River backcountry. My first trip of 2019. I need to get back to that area...nit far from me but haven't been there in several years. Tippi any plans this year for Roan mountain? Denis---I haven't done Roan Mt since 1990 but there's a plan in the works. Very nice. 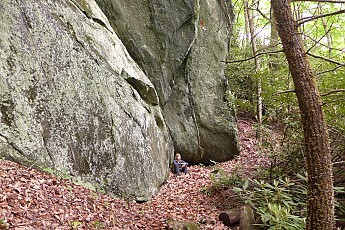 I'm new to the forum but spend a lot of time hiking in Pisgah. Was trying to get to Mackey Mountain last week but the road in was closed and ended up doing Kitsuma because it was close. The week before I did Dobson's Peak from the MST leaving from the west side of the Linville Gorge which I think is also technically in Pisgah NF. Last time I went to Raider Creek/Harper Creek area the water was flowing really high and I can imagine what it must be like this year. All forums: Older: Pot size Newer: Does anyone have a pair of Galibier Super Guide boots for sale (EU 45/46; US 11.5/12)?